The chapel of ease in the parish of Battle was built at the expense of the then Dean of Battle, Edward Nevill Crake, roughly on the place where the Conqueror mustered his men before the battle (1 p117). 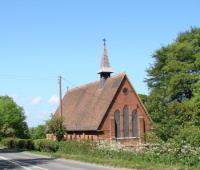 The land had been given to the parish in 1875 and the chapel was competed in the following year (Foundation stone). Previously there had been worship in a nearby barn and the initial intention was to use the new chapel as a school during the week (1 ibid). 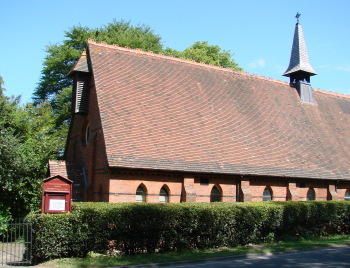 The church is built of brick with lancets, including an east triplet, and a steep roof. Nave and chancel are continuous and over the junction between them is a belfry with an overhanging spirelet, whilst in addition there is a cage-like structure on the west wall, which contains three tubular bells. This was added shortly after 1911 (ibid p119). Though the chapel is quite substantial, the name of the architect has not survived. Inside he designed a roof of some complexity, perhaps necessitated by the steep pitch and low side walls. Font: Small octagonal bowl on a single stem of marble. 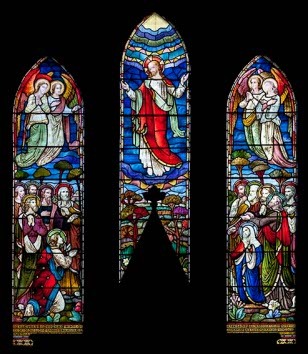 Glass: (East window) c1880. This is a powerful and colourful representation of the Ascension, though the identity of the designer is unknown. It has been suggested that it was brought here from elsewhere (1 p119), but this seems unlikely as it fits perfectly and commemorates someone who died in 1880, very soon after the chapel was built. Reredos: Though quite small, this has a single gable that cuts into the base of the east window and has pierced cusping on its inner side. It probably dates from the construction of the church or soon after. My thanks to Nick Wiseman for the photograph of the east window and information about the fittings.